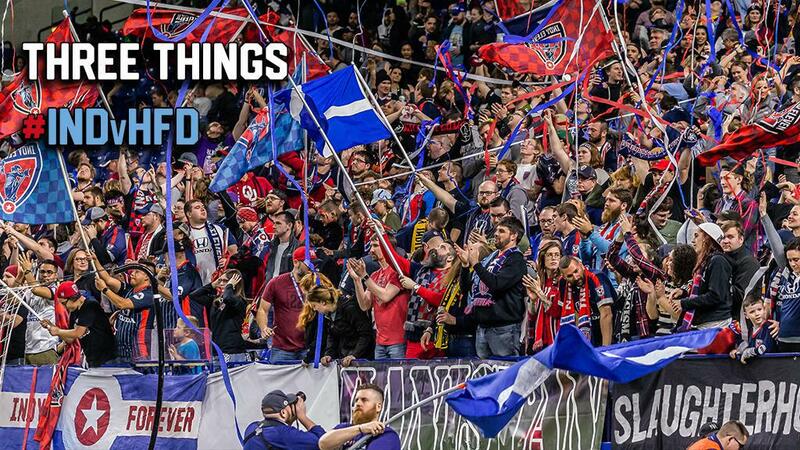 After every game in 2019, IndyEleven.com’s Drew Kamaski will give his three takeaways from the performance of the Boys in Blue. This week's edition comes after Indiana's Team won 1-0 in the team's 2019 Home Opener against Hartford Athletic. There was no lack of support in Indy Eleven’s 2019 home debut. Last Saturday, the Boys in Blue drew a franchise record-breaking crowd of 20,251 in Lucas Oil Stadium, eclipsing the team’s previous record by 2,716 attendees. The attendance wasn’t the only cause for celebration. Indy Eleven defeated USL Championship Eastern Conference newbies Hartford Athletic thanks to an own goal by visiting defender Nikolaj Lyngø. The win brought Indy Eleven’s record to 2W-1L-0D on the season, moving them up to fifth place in the standings at the end of Week 4. There’s no better feeling than crawling into your bed with clean, fresh sheets. Except maybe the feeling of earning your first clean sheet and brick from the Brickyard Battalion. Boys in Blue like goalkeeper Evan Newton did just that last match. The 31-year-old goaltender recorded his first clean sheet of the season in the 2019 home opener against Hartford Athletic. Newton made two saves throughout the 90 minutes. The former FC Cincinnati keeper turned Boys in Blue snagged two dead ball opportunities and killed Hartford’s hopes of breaking the deadlock. The 2018 USL Championship Golden Glove recipient will be looking to top his nine clean sheets recorded last year in his first season with Indiana’s Team. Indy Eleven defender Alex Crognale received his first nod from Head Coach Martin Rennie in Saturday night’s game. Crognale, who came to Indy on loan from Major League Soccer’s Columbus Crew SC on March 15, earned his first start in the 1-0 victory over Hartford after making his first appearance on the bench in the club’s previous away outing. The 24-year-old played in integral role in Rennie’s back three during the victory. The lengthy center back led every defender in defensive statistics throughout the night. The Columbus Crew youth product recorded seven clearances and two tackles and interceptions. He also moved the ball well up from the back third, averaging 88 percent passing accuracy in what was arguably a man of the match performance in his debut. Don’t miss your chance to see the Boys in Blue up close and personal. Season Ticket packages, which include 17 regular season home game tickets, are on sale now for as low as $99. Get your season ticket package today by visiting IndyEleven.com/season-tickets or by calling 317-685-1100.